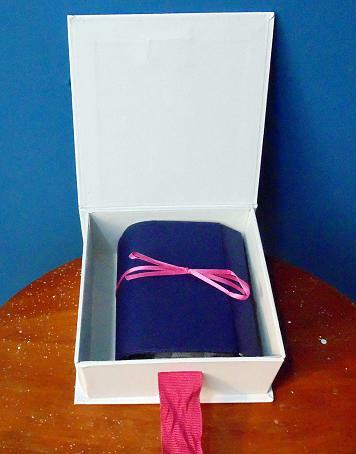 If you would like more info on what Rocksbox is, you can view my first post about it here. 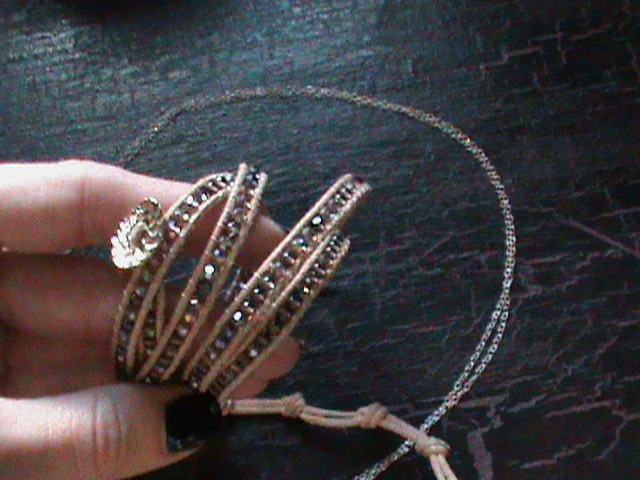 This month I got a pair of earrings, a necklace and a bracelet. Again this month, I like all three items, but the bracelet is the only item I would have picked up on my own. I actually have one almost identical to it, so I won’t be purchasing, but obviously I really like it. I really like some parts of the earrings but not others, so I’m undecided on those. 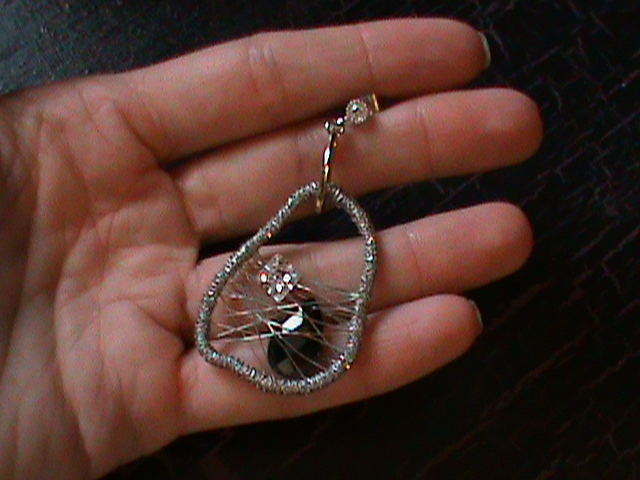 They are really sparkly around the outside as well and in the middle with the black and crystal gems, and the post has a crystal on the end too. I don’t like that they sort of look geometrical and the link at the top is gold. I feel like the gold throws it off for me. I’m not in love with them so I don’t see any reason to purchase, but I will get use out of them for the next couple of months. 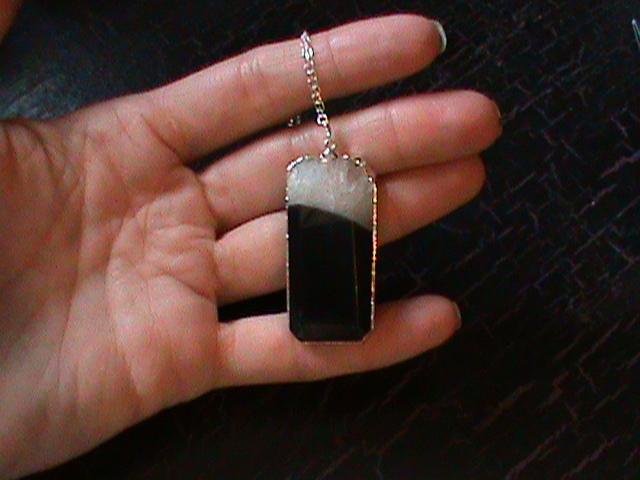 The necklace is long, pendant style and I find it to be sort of plain, nothing all that special or striking about it. I have worn this twice in one week though, it is easy to wear because it matches with most everything and works well this time of year. I do need longer necklaces, so that is probably why I’ve been using it often and will continue to until it is time to send it back, but again, I will pass on this for something that I find more captivating. I am still very happy with this program and love the idea of jewelry rental without the high priced committal. I can’t wait for next month’s shipment! If you would like to join, you can use my referral link here and use the code “friendsrock” to try it free for a month. Let me know if you try it for yourself! 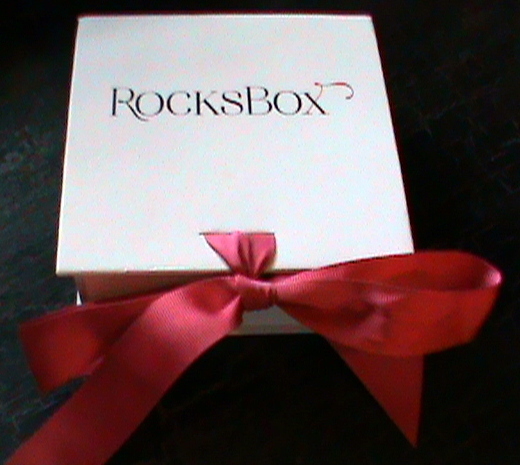 My First Rocksbox has Arrived! What it is: Rocksbox is a jewelry subscription service that sends you three pieces of jewelry each month, you get to wear them for 60 days, then return or keep them. I was so excited to get my first Rocksbox. Jewelry shopping is so tedious for me so I was happy to give this service a try. I had a free coupon for my first month too, so nothing to lose there. 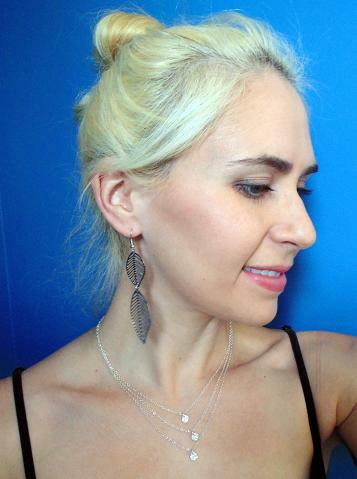 When I first logged on to Rocksbox, I registered and took a style quiz to help them determine what type of style I have and on what occasions I like to wear jewelry. I chose jewelry for work and weekend. 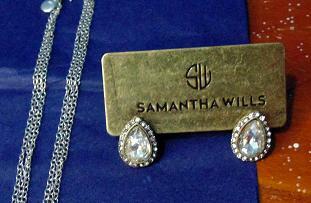 The idea is that you can try out any of the designer jewelry they send for 60 days. (You still get monthly shipments if you keep your membership going.) At the end of the 60 days, you return the jewelry in the prepaid shipping envelope that is included. If you like any of the jewelry enough to keep, just don’t return that piece and your card gets charged for it. You get 20% off retail if you choose to purchase anything and the retail value of the three pieces combined is usually around $200. So basically you can rent jewelry that has been hand picked for you and choose to keep it if you like. Subscription cancellation is as easy as logging in to the dashboard section of the site and sending a cancellation message. I really didn’t intend to keep my membership going past the first free month, but once my box arrived, I liked it so much that I decided to purchase a six month subscription right away. The monthly fee is $19 but you get discounts for purchasing in six or 12 month packages. I easily spend more than that on jewelry in a year and I end up hating most of it and never wearing it anyway so for me this is a great deal. My package came in a bubble envelope with a box tied with a pink ribbon and inside were three organza baggies wrapped in tissue paper. The packing slip inside tells you when the items must be returned and the cost of each, all of it is in big print and very easy to read/understand. Nothing shady or sneaky going on to try to get money. There is also a little comment card inside to indicate how you feel about each piece so they can better choose your next box. I examined all of the pieces and noticed that they are all of excellent quality. At first, the only thing I found to be really striking were the teardrop earrings, but I figured I should try new things since I have access to these pieces for two months. After wearing the leaf earrings, I thought they were nice and would probably wear them now and then, but they weren’t anything special. The necklace that I thought was so basic at first really grew on me and I decided I had to keep it. There was something so sweet and simple about it. 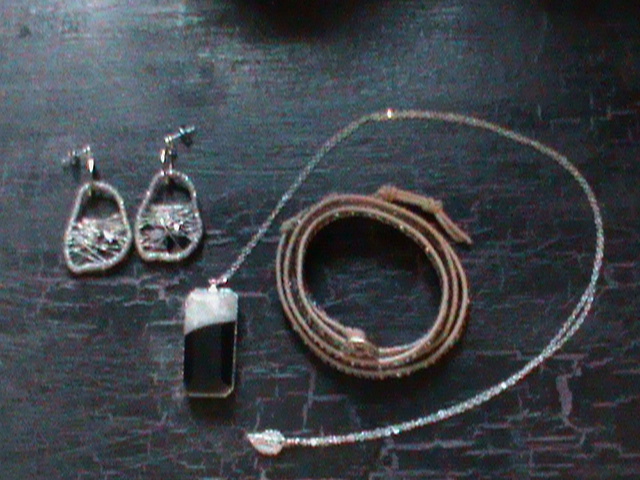 Those teardrop earrings were a must from the get-go, so all in all, my first Rocksbox was really successful. I was really happy with the selection they chose for me. I don’t think I would have picked any of those items for myself but ended up really falling in love with two of them. This is exactly what I was hoping for when I subscribed. I really needed to broaden my jewelry style horizon, as my rocker chic style doesn’t transition into the work week very well. If anyone is interested in subscribing, you can use this link: Rocksbox-Elissa and I will get referral credit, which is awesome. And, the code for your first month free is: friendsrock. If anyone subscribes, send me some pics and show me what you get! I might look into some other subscription services, I’m really loving this! Help us Reach 100 Subscribers and You Could Win! That’s right, when we reach 100 subscribers, a special treat is in store. This will be open to all our readers (not just the 100th person) and it will be easy peasy. Not sure what type of question/contest it will be yet but the prize is pretty amazing! We’re averaging 10 subscribers per week so we’ll be there in no time with your help. Thanks for getting us off to a great start! Discount Exclusive to Glamour Harvest Subscribers! Liked the makeup remover rounds I reviewed earlier? Glamour Harvest subscribers can enjoy 10% off any purchase through September 1st. Now is the time to try these out or purchase custom baby/wedding shower/party favors. Use discount code “glamour” at checkout.